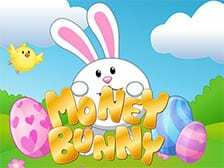 Money Bunny is a playful and friendly 3 reel slot game destined to warm your heart with its kindergarten graphics and loveable tone. Enjoy butterfly and carrot symbols as you attempt to win bonus rounds and free spins. Not looking for this game? Click to play online slots now! No other online slot games developer combines nostalgia with creative spin slot games quite like Eyecon. Famous for titles such as Fluffy Favourites, Irish Luck and Shaman’s Dreams. Year after year Eyecon continues to impress, often being firmly placed in 888 Casinos Top 10 Game Developers among others. 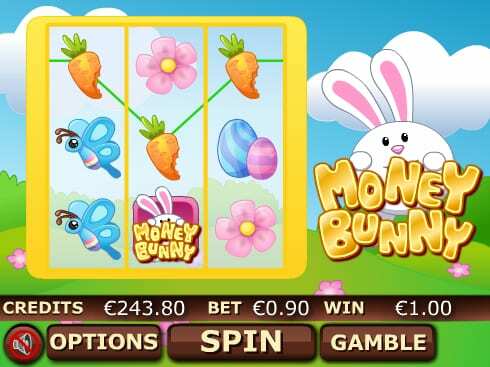 Not just a game that is best played in Easter, Money Bunny is an online slot that combines lovers of 3 reels classic slots and the bright pastels of a game that is sure to entertain no matter the occasion. The first thing that will grab your attention will be the very bright colours of this game. Most online slots are known for their dark atmosphere which plays to the strengths of their specific game. With Money Bunny, however, the bright colours represent not only the games motif but also how you’ll end up feeling after falling in love with how addictive this game is. Read more about this game's features to know why it's considered in top 10 best slots for new players. Money Bunny is a 3 reel 9 line classic slot game. Starting bets begin at 1p and can be adjusted to whatever set bet you wish to hop on. Easy to use sliders can be used to select the number of lines and the amount you wish to bet. The sliders can be found at the bottom of the screen via the pink bars and the bet button. Money Bunny is very unique in the fact that it allows you the player to use an ‘Auto Play’ feature. This feature allows you to pre-select a maximum of 20 spins that run automatically at a time of your choosing. Not for your taste? The autoplay feature can be turned off at any time by selecting the stop button. As you’d come to expect at this point, the symbols that feature in the game consist of everything bushy tailed: the Money Bunny game logo, carrots, chicks and butterflies are just a few examples of the very detailed game pieces found within the game. Keep your eye on the Money Bunny logo, this piece offers the highest payout when 3 are found in a line. This symbol is also the wild piece, matching it will cause a variety of changes to your game, one of which gives you eight free spins, so definitely keep your eye out for that one! In addition, you should always look for the scattered Basket symbols, these little blighters can trigger Money Bunnies ‘Prize Pick’ feature. These symbols can be found anywhere on any reel making them very unpredictable, and with good reason. When 3 or more of the symbols connect you can win additional accumulators that have the chance to multiply your winnings as high as 111x your bet! Our most popular game is our starburst slot online.